Ho-Onkoo, meaning a gathering to express our indebtedness and thankfulness, is a memorial service in honor of Shinran Shonin. It is also an occasion to express our gratitude to Amida Buddha for having awakened us to life's supreme meaning. Ho-Onko is the most important Jodo Shinshu ceremony. At Honzan, our parent temple in Kyoto, Japan, Ho-Onko is a week-long observance from the 9th through the 16th of January. 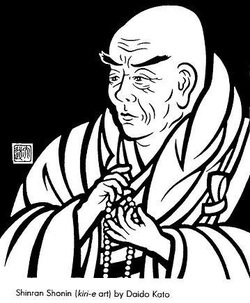 According to the western calendar, Shinran Shonin was born on May 21, 1173 and died on January 16, 1262. After his death, Shinran's followers would gather in memory of their teacher on the 28th day of each month according to the traditional lunar calendar. Some 33 years later, Kakunyo Shonin, the 3rd Gomonshu, a descendent of Shinran sama and head of the Hongwanji religious organization, established the regulations for this ceremony called Ho-Onko Shiki. Later, the 4th Gomonshu, Zonkaku Shonin, set the observance for once a year. The ceremonies were started on the 21st and concluded on the 28th of the 11th month according to the lunar calendar. In 1872, the Hongwanji-ha (Nishi Hongwanji) changed to the western calendar, setting the date of Shinran sama's death at January 16. The Otani-ha (Higashi Hongwanji) observes Ho-Onko according to the old lunar calendar and has established the date as the 28th of November. Ho-Onko is one of the principal religious festivals in which one participates in "Hearing the Light" of Amida's Compassionate embrace through listening to Dharma Messages, holding ritual ceremonies, and participating in Sangha Fellowship.